The rear door of the black limo clicked open and Thalia hissed: "Graisseux." "So we meet again, Thalia Mews," said the obese passenger. One of the gunmen--Singlebrow--herded me and Thalia into the limo's interior. The other goon-- Noneck--drove. "What's your game, Graisseux?" I asked. "A new dawn of happiness for mankind--under my leadership," he said. He nodded and the sluglike flesh of his face wobbled. "Yes. Mankind fears new ideas--with good reason. New ideas cause anger and friction and heat. I have devised a way to end new ideas." Graisseux displayed a four-inch cube of clear plastic. A scaly nightmare of an insect rattled inside it. "This is one of my genetically modified bugs," he said. "It detects, feeds upon, and destroys new ideas." Thalia said to me, "You must find the art director--if anyone can fight Graisseux it is him--his ideas are sharp and to the point--he was a mordant son-of-a-" Singlebrow's smothering grip cut her off. Graisseux said, "Perhaps Thalia's art director should be the final test of the bugs . . .yes." He looked at me. 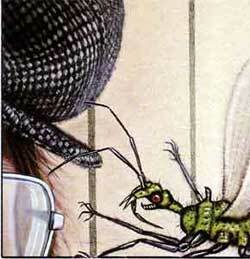 "And just in case the private detective is getting any ideas..."
He opened the cube and the bug darted toward me. It attacked behind my back and suddenly I wouldn't have known a new idea if it bit me. Eventually the limo stopped and they kicked me out. Graisseux said, "If you want Thalia to stay healthy, stay missing."